Anarcharis planchonii , Caspary) Rydb. Anarcharis pomeranica , (Rchb.) Peterm. Philotria canadensis , (Michx.) Britt. Philotria planchonii , (Caspary) Rydb. Elodea canadensis a submergent, aquatic plant, native to North America, has spread rapidly and easily throughout the world. Particularly in Europe, this species is very invasive and is considered a weed due to its ability to grow and multiply fairly rapidly in many diverse habitats and conditions. It is capable of causing problems of economic importance, habitat alteration, competition and threat to biodiversity. In addition, this species is not easily manageable. For these reasons, this species has been the focus of many experiments and research in the hopes of establishing a greater knowledge of growth habits, the true threat it causes, and possible prevention methods. Elodea species have a wide range of phosphorus content in their biomass (Garbey et al., 2004) and they are able to store this nutrient in their roots (Eugelink, 1998) to be used for growing when phosphorus levels in water are low. E. canadensis is also able to take up phosphors from the sediment by its roots, so reducing the phosphorus concentration in the water column in most cases is not able to reduce its growth. Elodea canadensis rapidly propagates through stem fragments dispersed by water currents, waterfowl and human activities, and flooding was the essential parameter of this expansion (Barrat-Segretain & Elger, 2004). Fragments grow in a wide range of light conditions and only a very marked reduction in light levels was able to restrict the growth of this plant. This species responded to cutting by producing more lateral shoots, which is very important in very poor light conditions under which the main shoots begin to die off quickly. It can, therefore, be expected that the death of a parent fragment will be followed by the continued growth of a young one detaching from it. Thus, this implies that fragments of this species are able to regrow into new individuals even when transported to the deeper part of the littoral characterized by low light levels (Mielecki & Pieczynska, 2005). Elodea canadensis is economically important as an ornamental species. It is sold in garden shops as “oxygen weed” for private ponds to improve water quality and pond scenery.\r\nIt is also an important part of lake ecosystems in its native habitat of North America. It provides habitat for aquatic invertebrates, fish and amphibians and is a food source for waterfowl, beavers and muskrats (Washington State Department of Ecology, Undated). Elodea Canadensis has a wide range of conditions in which it can grow. It can grow in very shallow to deep water and in slightly mineralized and acid water in siliceous sediments to heavily mineralized water in calcareous sediments. However, it prefers mesotrophic waters (CABI, 2005). This species can even grow slowly under ice cover and can survive inside the ice (Bowmer et al., 1995). Dense stocks can also partly survive, when the water level sinks and the plants on the banks are exposed to dryness for several weeks. (Experiments with E. nuttallii but \r\nE. canadensis will show the same tolerance to dryness, P. Podraza, unpublished data).In its native habitat, E. canadensis resides in surface standing waters, surface running waters: shallow lakes, ponds, pools, ditches and streams with slow moving water. In its invaded habitat, it can survive in the same environments; however it can survive in up to 3 meters of water depth in slow moving water, and in exceptional cases up to 16 meters in depth. It tolerates pH values from 6.0 to 7.5 and temperatures from 1 to 25 degrees in celcius (Gollasch, 2006). The foliage can stand much battering by turbulence, but, being poorly anchored or not at all, this species will not persist in waters with a continuously fast flow and favours still or sluggish conditions (Rodwell, 1998). Elodea canadensis is dioecious. Pollination occurs near the water surface and pollin is distributed by wind and water currents. Vegetative reproduction by fragments is very common (Gollasch, 2006). Seeds are seldom produced due to a shortage of male plants. Reproduction and dispersal are primarily vegetative by fragmentation of the stems that float away, root, and start new plants (CABI, 2005). In addition, vegetation reproduction by fragmentation is the main way in which a population is rebuilt. Fragmentation does not restrict the growth of this plant, and it can even stimulate it in favorable light conditions (Mielecki & Pieczynska, 2005). This type of reproduction by this plant occurs by shoot fragmentation. The stems are extremely brittle and the broken portions quickly produce adventitious roots (Rodwell, 1998). Nutrient availability in the sediment and water column is known to affect the composition of the community of submerged plants. 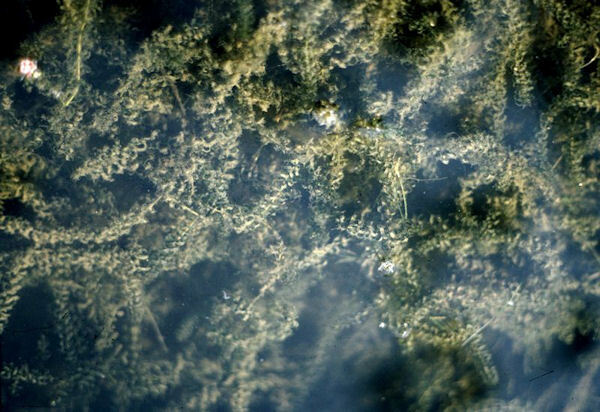 In addition, it has been suggested that turbidity and nutrient loads are the two factors controlling the occurrence of submerged macrophytes (Thiebaut, 2005) in lakes. In running waters in most catchment areas the nutrient concentration in sediments and water column cannot be reduced to a limitation level due to surface runoff from non-point sources. E. canadensis was probably introduced by aquarists or by transport vehicles and transport together with fishes taken from lakes (Kozhova & Izhboldiana, 1993).Introduction of E. canadensis into a country has almost certainly been via the trade in live aquarium plants, legal or otherwise (Bowmer, Jacobs & Sainty, 1995).E. canadensis can be dispersed via ships as fragments attached to anchor chains or fenders.E. canadensis is sold in garden centre shops as oxygen weed for private ponds to improve water quality and pond scenery. Recommended citation: Global Invasive Species Database (2019) Species profile: Elodea canadensis. Downloaded from http://www.iucngisd.org/gisd/species.php?sc=290 on 21-04-2019. It might only take three to four seasons for Elodea canadensis to assume the proportion of a major pest at a site, with such luxuriance being maintained for up to a decade more (Rodwell, 1998). In the latter half of the 19th century and the first half of the 20th century, this species was extremely problematic to Europe, having spread rapidly throughout and causing major environmental problems (CABI, 2005). This waterweed can have a general negative impact on the functioning of the aquatic ecosystem and it will outcompete native aquatic plants. In addition, it can impede water flow and adversely affect recreation activities (CABI, 2005). This plant responds to shading by decreasing its foliar investment and elongating its internode's length to overtop direct competitors, a developmental response that brings their larger leaves into a more favourable light environment (Herault, Bornet & Tremolieres, 2008). Fragments of this species have high survival rates which allow them to be dispersed over long distances, therefore increasing their invasion capabilities (Barrat-Segretain, Elger, Sagnes et al 2002). Extracts from this species reduce the growth of several aquatic primary producers, among them epiphytic algae and cyanobacteria isolated from different submersed macrophytes (Erhard & Gross, 2006). Physical: Mechanical removal of the biomass will temporarily reduce the populations and their proliferation. However, as the plant spreads through fragmentation, it is essential to prevent the spread of plant fragments by creating filters downstream before any mechanical treatment is carried out. All plants removed must be carefully disposed of to prevent dissemination of fragments (CABI, 2005). This plant can be easily cut and controlled for short periods by mechanical control methods. The cut weed should be removed from the water to avoid deoxygenation. However the growing rate of E. canadensis is very fast and the effects of mowing only last for a few weeks (P. Podraza, pers. comm.). Continued mowing of the invasive water plant species Myriophyllum spicatum has led to its disappearance from the system in some cases. However this has not been successful with a similar species E. nuttalli and it is thought that it would also be unsuccessful with E. canadensis (P. Podraza, pers. comm.). Other appropriate methods of mechanical control include removal by hand, raking, chains, weed bucket, weed boat or dredging (CEH, 2004). E. canadensis is adapted to stagnant or slow flowing waters. Increasing flow velocity in running waters can reduce the plant density. Biological: Introduction of herbivorous fish such as grass carp (Ctenopharyngodon idella) has been proposed as a possible agent in the control of this waterweed. Active feeding of grass carps occurs at 7-8°C and active feeding requires 20°C (NatureServe, 2008). During active feeding grass carps are able to consume 75-200% of their body mass per day (Clugston & Shireman 1987, in Jordan, 2003) and are voracious, unselective feeders; they are able to destroy the entire palatable aquatic vegetation in a water body (Jordan, 2003).Carp may also cause increased densities of phytoplankton, due to fish metabolism causing the mobilisation of nutrients (Perrow et al., 1999) This can be a very serious problem when the density of toxic cyanphycea (blue-green algae) increases. Stocking up carp population densities may increase the biomass of unpalatable species at the expense of the more palatable ones (Bowmer et al., 1995). Rudd (Scardinius erythrophthalmus), a native fish species in Europe, which is omnivorous but prefers Elodea to feed on, is very suitable for weed control. It has minor ecological disadvantages, but their feeding capacity is low (Podraza, 2009). Common carp and other bottom feeding fish, which create turbid water, can also be effective in preventing regrowth of the plant after mechanical removal or control by a herbicide (CEH, 2004). In addition a fungus (Fusarium sp.) (Gollasch, 2006) and some nematodes (Gerber & Smart, 1987) were identified in laboratory tests as damaging to E. canadensis. Chemical: Diquat and copper sulphate or chelates of copper can be used in stagnant water. The addition of copper is reputed to improve control compared with diquat alone, and is also advantageous because algae are inhibited. However copper is toxic to most crustacean species, affects fish reproduction and may impact the food web structure, e.g. by reducing the zooplankton densities. Terbutryne is used for control of various submerged weeds. Acrolein gives temporary control in flowing water. It is injected into the water and allowed to flow over the weed beds (Bowmer et al., 1995). Environmental: Shade will control most submerged aquatic plants. This can be achieved by planting trees on the south side of waterbodies or by using a floating sheet of opaque material (CEH, 2004). Informations on Elodea canadensis has been recorded for the following locations. Click on the name for additional informations. Barrat-Segretain, Marie-Helene; Bornette, Gudrun., 2000. Regeneration and colonization abilities of aquatic plant fragments: Effect of disturbance seasonality. Hydrobiologia. 421(1-3). March 1, 2000. 31-39. Barrat-Segretain, Marie-Helene; Cellot, Bemard., 2007. Response of invasive macrophyte species to drawdown: The case of Elodea sp. Aquatic Botany. 87(4). NOV 2007. 255-261. Bowmer, K., Jacobs, S.W.L & Sainty, G.R. 1995. 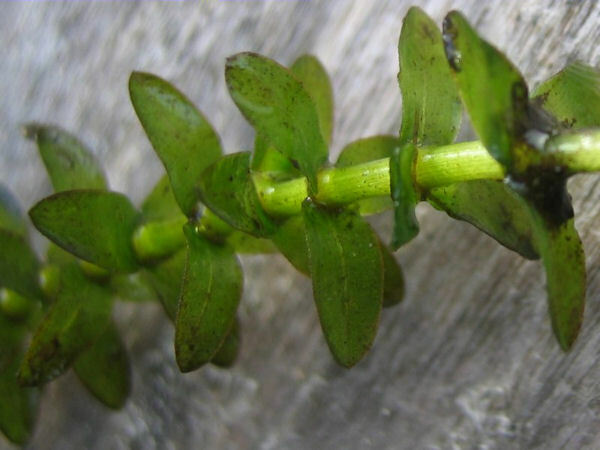 Identification, biology, and management of Elodea Canadensis, Hydrocharitaceae. Journal of Aquatic Plant Management 33: 13-19. Champion, Paul D., Hofstra, Deborah E. & Clayton, John S. 2007. Border control for potential aquatic weeds. Stage 3. Weed risk management. Science & Technical Publishing New Zealand Department of Conservation. 2007. Glomski, Lee Ann M.; Skogerboe, John G.; Getsinger, Kurt D., 2005. Comparative efficacy of diquat for control of two members of the hydrocharitaceae: Elodea and Hydrilla. Journal of Aquatic Plant Management. 43 JUL 2005. 103-105. Jordan, M. 2003. Review- Grass carp: are they a safe biological control agent for nuisance aquatic vegetation? Josefsson, Melanie; Andersson, Berta., 2001. The environmental consequences of alien species in the Swedish lakes Malaren, Hjalmaren, Vanern and Vattern. Ambio. 30(8). December, 2001. 514-521. Larson, D. 2007. Non-indigenous Freshwater Plants � Patterns, Processes and Risk Evaluation. Doctoral dissertation. ISSN 1652-6880, ISBN 91-576-7314-5. Riis, Tenna; Sand-Jensen, Kaj., 2006. Dispersal of plant fragments in small streams. Freshwater Biology. 51(2). FEB 2006. 274-286. Skurdal, J.; Garnas, E.; Taugbol, T., 2002. Management strategies, yield and population development of the noble crayfish Astacus astacus in Lake Steinsfjorden. Bulletin Francais de la Peche et de la Pisciculture.(367). Decembre 2002. 845-860. Baltic Sea Alien Species Database, 2007. Olenin S, Daunys D, Lepp�koski E, Zaiko A (editors). Barrat-Segretain, Marie-Helene., 2001. Invasive species in the Rhone River floodplain (France): Replacement of Elodea canadensis Michaux by E. nuttallii St. John in two former river channels. Archiv fuer Hydrobiologie. 152(2). September, 2001. 237-251. Barrat-Segretain, Marie-Helene., 2004. Growth of Elodea canadensis and Elodea nuttallii in monocultures and mixture under different light and nutrient conditions. Archiv fuer Hydrobiologie. 161(1). September 2004. 133-144. Barrat-Segretain, Marie-Helene., 2005. Competition between invasive and indigenous species: impact of spatial pattern and developmental stage. Plant Ecology. 180(2). OCT 2005. 153-160. Barrat-Segretain, Marie Helene; Elger, Arnaud., 2004. Experiments on growth interactions between two invasive macrophyte species. Journal of Vegetation Science. 15(1). February 2004. 109-114. Barrat-Segretain, Marie-Helene; Elger, Arnaud; Sagnes, Pierre; Puijalon, Sara., 2002. Comparison of three life-history traits of invasive Elodea canadensis Michx. and Elodea nuttallii (Planch.) H. St. John. Aquatic Botany. 74(4). December 2002. 299-313. CABI Bioscience Switzerland Centre report to The Swiss Agency for Environment, Forests and Landscape SAEFL Delemont. 2005. An inventory of alien species and their threat to biodiversity and economy in Switzerland. 2005. Cassandra S. James; Eaton, John W.; Hardwick, Keith., 2006. Responses of three invasive aquatic macrophytes to nutrient enrichment do not explain their observed field displacements. Aquatic Botany. 84(4). MAY 2006. 347-353. Cook, C.D.K. & Urmi-K�nig, K. 1985. 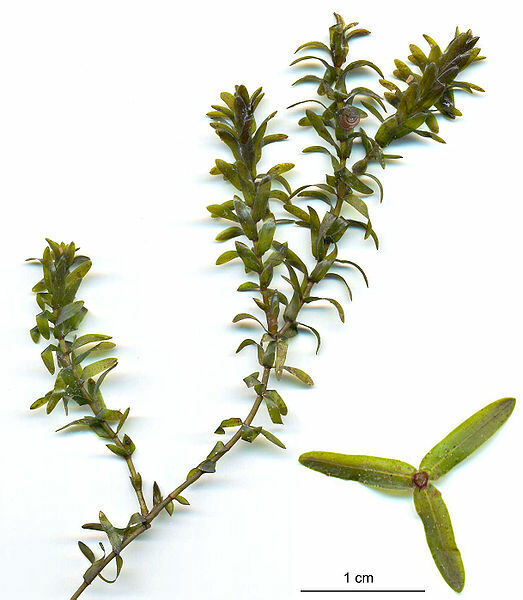 A revision of the genus Elodea (Hydrocharitaceae). Aquatic Botany 21: 111-156. Erhard, Daniela; Gross, Elisabeth M., 2006. Allelopathic activity of Elodea canadensis and Elodea nuttallii against epiphytes and phytoplankton. Aquatic Botany. 85(3). OCT 2006. 203-211. Eugelink, A.H. 1998.Phosphorus uptake and active growth of Elodea canadensis Michx. and Elodea nuttallii (Planch) St. John Water Science and Technology 37(3): 59-65. Garbey, C., Murphy, K.J., Thiebaut, G. & Muller, S. 2004. Variation in P-Content in aquatic plant tissue offers an efficient tool for determining plant growth strategies along a resource gradient. Freshwater Biology 49: 1-11. Gerber, K. & Smart, G.C., Jr. 1987. Plant-parasitic nematodes associated with aquatic vascular plants. In A. Veech & D.W. Dickson (Eds)., Vistas on Nematology (pp. 488-491). Greulich, Sabine; Tremolieres, Michele., 2006. Present distribution of the genus Elodea in the Alsatian Upper Rhine floodplain (France) with a special focus on the expansion of Elodea nuttallii St. John during recent decades. Hydrobiologia. 570 OCT 15 2006. 249-255. Herault, Bruno; Bornet, Aurelien; Tremolieres, Michele., 2008. Redundancy and niche differentiation among the European invasive Elodea species. Biological Invasions. 10(7). OCT 2008. 1099-1107. Hessen, Dag O., Jostein Skurdal & Jan E. Braathen., 2004. Plant exclusion of a herbivore; crayfish population decline caused by an invading waterweed Biological Invasions 6: 133�140, 2004. Hokstad, Ove; Skurdal, Jostein. , 1996. Spreading of freshwater organisms in Norway. Fauna (Oslo). 49(1). 1996. 10-19. Integrated Taxonomy Information System, 2009. Elodea canadensis Michx. Jagel, A. 2006. Detta faktablad om Elodea Canadensis resp. Elodea nuttallii skapades den. Josefsson, Melanie., 1999. Introduced organisms in Swedish freshwater environment. Fauna och Flora (Stockholm). 94(2). July, 1999. 75-84. Kelly, David J.; Hawes, Ian., 2005. Effects of invasive macrophytes on littoral-zone productivity and foodweb dynamics in a New Zealand high-country lake. Journal of the North American Benthological Society. 24(2). JUN 05. 300-320. Kleiven, Einar; Dolmen, Dag., 1999. Elodea canadensis Michx in Molandsvatnet, Arendal, South Norway. Blyttia. 57(3). 1999. 117-119. Kornijow, Ryszard; Vakkilainen, Kirsi; Horppila, Jukka; Luokkanen, Eira; Kairesalo, Timo., 2005. Impacts of a submerged plant (Elodea canadensis) on interactions between roach (Rutilus rutilus) and its invertebrate prey communities in a lake littoral zone. Freshwater Biology. 50(2). February 2005. 262-276. Larson, D; Willen, E., 2006. Nonindigenous and invasive water plants in Sweden. Svensk Botanisk Tidskrift. 100(1). 2006. 5-15. Martinsson, Karin; Jacobson, Anders., 1997. Alisma wahlenbergii in Sweden: Past and present. Svensk Botanisk Tidskrift. 91(6). 1997. 599-614. Mielecki, Marcin; Pieczyska, Ewa., 2005. The influence of fragmentation on the growth of Elodea canadensis Michx. in different light conditions. Polish Journal of Ecology. 53(2). 05. 155-164. Riis, Tenna; Biggs, Barry J. F.; Flanagan, Marty., 2003. Seasonal changes in macrophyte biomass in South Island lowland streams, New Zealand. New Zealand Journal of Marine & Freshwater Research. 37(2). June 2003. 381-388. Rodwell, John S., Nature Conservancy Council (Great Britain), Joint Nature Conservation Committee (Great Britain). British Plant Communites: Aquatic Communities, Swamps and Tall-Herb Fens.1998. Pages 76-78. Rorslett, Bjorn., 1995. Canadian pondweed, Elodea canadensis Michx, new to West Norway. Blyttia. 53(4). 1995. 169-176. Thiebaut, G. 2005. Does competition for phosphorus supply explain the invasion pattern of Elodea species? Water Research 39: 3385-3393. Thiebaut, G. ; Rolland, T.; Robach, F.; Tremolieres, M.; Muller, S., 1997. Some consequences of the introduction of two macrophyte species, Elodea canadensis Michaux and Elodea nuttallii St. John, in continental aquatic ecosystems: Example of two areas in the North-East of France: Alsace Plain and Northern Vosges. Bulletin Francais de la Peche et de la Pisciculture. 0 (344-345). 1997. 441-452. USDA, ARS, 2009. Taxon: Elodea canadensis Michx. National Genetic Resources Program. Germplasm Resources Information Network - (GRIN) [Online Database]. National Germplasm Resources Laboratory, Beltsville, Maryland. USDA, NRCS. 2009. Elodea canadensis Michx. Canadian waterweed The PLANTS Database. National Plant Data Center, Baton Rouge, LA 70874-4490 USA. Wade, P. M., 1999. The impact of human activity on the aquatic macroflora of Llangorse Lake, South Wales. Aquatic Conservation. 9(5). Sept.-Oct., 1999. 441-459. Washington State Department of Ecology. Undated. AmericanWaterweed � a common native plant. Wells, Rohan D. S; Clayton, John S; De Winton, Mary D. 1998. Submerged vegetation of Lakes Te Anau, Manapouri, Monowai, Hauroko, and Poteriteri, Fiordland, New Zealand . New Zealand Journal of Marine & Freshwater Research. 32(4). Dec., 1998. 621-638. Wells, Rohan D. S.; De Winton, Mary D.; Clayton, John S., 1997. Successive macrophyte invasions within the submerged flora of Lake Tarawera, central North Island, New Zealand. New Zealand Journal of Marine & Freshwater Research. 31(4). Dec., 1997. 449-459. Wingfield, Ruth and Kirsten Black., undated. Species Profile. Slender naiad. F&WS 6 Slender Naiad Action Plan. Wium-Andersen, S. 1987. Allelopathy among aquatic plants. Archiv fuer Hydrobiologie 27: 167-172.